St Teresa’s independent girls school enjoys a stately home setting in the Surrey Hills in south England. But as the modest 18th-century home transitioned in the 20th century from private home through convent and on to become a school, its piecemeal evolution resulted in a sprawling grid of buildings of a fairly solid, quotidian character, which obscures any sense of order within the campus or engagement with the rolling vistas beyond. A distinctly different spirit is expressed in the new two-storey, cedar-panelled, sixth-form building just completed by young London practice IF_DO: it brings light, grace and clarity to an area formerly occupied by squat, grey prefabs that turned their back on the mature woodland that fringes the site (and is now incorporated so deftly into the materials here). This building represents the unlocking of the campus’s potential, both in the quality and expressive character of its design. Its engagement with the setting will continue to improve, with the strategic opening up of sightlines and pathways to the spectacular surroundings, as laid out in IF_DO’s 10-year masterplan for the site. The brief from head teacher Mike Farmer was to provide an aspirational sixth-form block with smaller classrooms but shared study and social spaces, conveying a university-style teaching experience; a landmark building that would work towards retaining existing pupils and attracting new ones. Competing against three other schemes (mostly from project management and design teams), IF_DO’s winning design took the idea of external circulation as its starting point — given the school’s sprawling layout, the pupils and staff are used to strolling between classrooms — but expressing it through a contemporary cloistered typology that provides covered walkways around and between the sixth form’s two blocks. The larger teaching block features two floors of classrooms, offices, common room and study room. The adjacent block offers facilities to enrich not just the sixth form’s, but the wider school’s, activities, primarily a state-of-the-art, 120-seat lecture theatre. The two buildings connect via a two-storey lightwell framing a small courtyard, with a young silver birch tree planted at its centre (chosen to complement the cedar panelling, which will fade to silver over time). This tree rises up towards a sedum-planted roof. St Teresa’s is the first freestanding building IF_DO has completed since its widely celebrated (and Blueprint Award-winning) 2017 Dulwich Pavilion, and demonstrates its interest in sustainable and natural materials, and the restorative potential of trees and plants. IF_DO was keen to maximise all the potential benefits from the setting, given the abundant scientific evidence that views of trees and greenery reduce stress and improve cognitive ability and wellbeing. Orientation optimises that connection with nature. The two floors of classrooms are sited on the western side, with four on each level, directly overlooking an internal grassed courtyard. The common room and reading room overlook the adjacent mature woodland. The reading room is on the first floor, placing students up in the tree canopy which, viewed through large windows, helps to create a serene, focused study space. The ground-floor common room’s aspect is on to a south-facing patio with views to a nearby walled garden. The lecture theatre has full-width glazing on to the woodland. 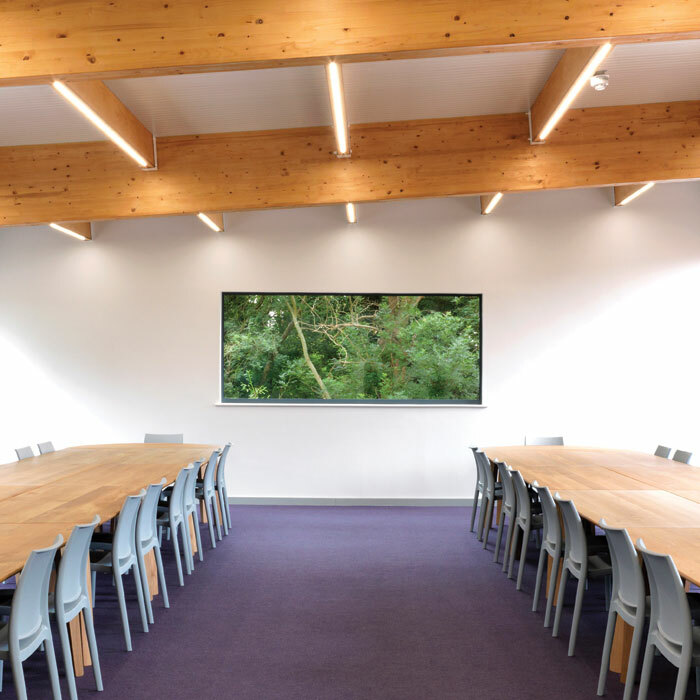 This arboreal orientation will provide an everchanging backdrop, connecting pupils to variations in the weather and the seasons; a further sensory element includes drainage spouts from the roof, down which rainwater will pour into the gravel around the silver birch’s base. The external walkways have a pragmatic as well as poetic purpose: by taking circulation outside of the gross internal area, the building footprint became smaller, which helped the scheme to win planning consent. Another crucial driver for the design came from tight financial constraints: with a budget of £1.5m for this 657 sq m building, modular construction offered major cost savings. So IF_DO partnered with award-winning system builder, Net Zero, which specialises in low-energy, pre-fabricated classroom blocks. The building is primarily constructed of pre-fabricated SIPs (Structural Insulated Panels), with a lightweight steel frame and glulam beams to form the larger spans over the central canopy and lecture theatre. It offers high levels of insulation and a heat-recovery ventilation system. A 320 sq m PV array on the roofs of both blocks should generate more than enough power to heat and light both buildings, with some to spare.